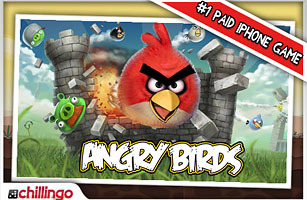 Get your slingshots at the ready: Angry Birds are coming your way. The popular mobile game (whose publisher, Chillingo, was recently bought by video-game conglomerate EA) might seem simple, but it's deceptively difficult. A bunch of greedy green pigs have stolen the birds' eggs. To get back at the enemy, you fling birds of varying sizes and skills with a slingshot in order to topple structures the pigs have made to defend themselves. It's incredibly addictive, and you'll notice your phone battery quickly drain as you spend hours trying to conquer each level. It's all worth it just to know that you bested those pesky pigs who keep stealing what's rightfully yours.